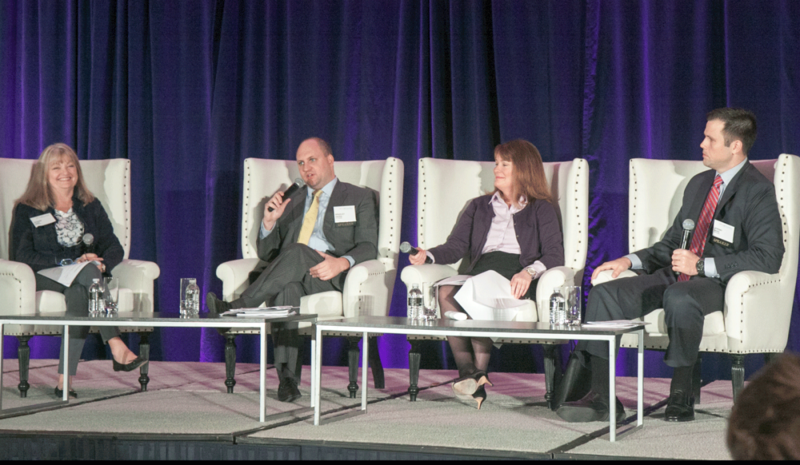 Federal data breach legislation, firsthand coverage of the race for the White House, policy reform priorities for 2016, and a second year legislative session preview were all covered Wednesday at the 2015 Fall Public Affairs Conference. A discussion of data security policy challenges opened the Wednesday morning agenda. The “Where’s the Breach?” session was moderated by Jeanne Cain, California Chamber of Commerceexecutive vice president of public policy. Also featured were CalChamber Policy Advocate Jeremy Merz, Bradley Hayes from the U.S. Chamber of Commerceand Lorinda Harris, DLA Piper. Hayes updated the audience about action at the federal level on the Cyber Security Information Act (CSIA). The legislation passed the U.S. Senate with bipartisan support last week and now moves to a conference committee in the House of Representatives. Hayes anticipates that the bill will pass and be signed into law by the president toward the end of the year. Expanding definitions of personal information. States including deadlines for businesses to notify consumers. Expanding the reporting requirements to government agencies. Above all, Harris said, that any future legislation on this issue must be workable for all parties; consumers have to understand there must be a balance between feeling comfortable that their information is protected, versus their desire to have the most innovative technology. SB 570 (Jackson; D-Santa Barbara) Increases Litigation Exposure and Costs. Before amendments, unnecessarily created new litigation exposure on employers for insufficient breach notices and expanded costly breach mitigation service requirements without providing any additional benefits to consumers. Opposition removed due to July 2, 2015 amendments. CalChamber was Neutral. The bill was signed by the Governor. AB 964 (Chau; D-Monterey Park) Requires Unnecessary and Incomplete Consumer Notifications. Before amendments, created an arbitrary 30-day deadline for businesses to notify consumers of personal information breaches which would potentially result in premature, incomplete or unnecessary notifications being sent out prior to completion of a breach investigation. Opposition removed due to May 28, 2015 amendments. No Position. Signed by the Governor. SB 178 (Leno; D-San Francisco) Provides Clarity to Businesses. Modernizes digital surveillance laws and, in doing so, provides clarity to businesses regarding when and how the government can access electronically stored consumer information. 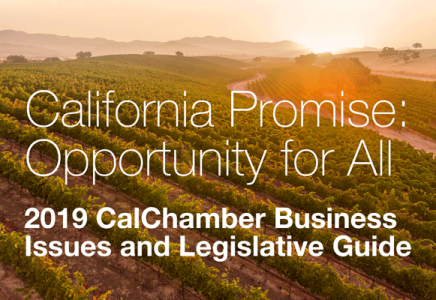 CalChamber Supported. Signed by the Governor. Asked whether federal legislation should or will create a national standard for data security, all panelists were quick to say that one standard will benefit businesses because there will be a clear understand of what is triggered when. Any standard, however, should avoid being overly prescriptive about the technology any business will be required to use to protect data because that area is always evolving. Currently, the data breach notification law is triggered by where the consumer resides, not where the company is located or where the breach occurred. (From left) Jeanne Cain, CalChamber executive vice president for policy, moderates an examination of data security policy challenges with panelists Bradley Hayes of the U.S. Chamber; Lorinda Hayes, DLA Piper; and Jeremy Merz, CalChamber policy advocate. The panel session about the 2016 presidential race included reporters who have covered presidential campaigns for decades and was moderated by Rob Stutzman of Stutzman Public Affairs. Joining Stutzman were Cathleen Decker of the Los Angeles Times, Todd Purdum from POLITICO, and Jon Ralston of The Ralston Report of Nevada. Stutzman asked the panelists what was unique about this election. Ralston explained that this campaign he is seeing an increased velocity of information. Campaigns are more savvy than he’s seen previously and information comes out and drops off so much faster than in previous election cycles. Decker responded that this race is unique because voters are just now getting a thorough look at candidates. Purdum was unsure if the normal election rules are going to apply because so many of the conventional norms have already been dismissed by voters. Collectively, the panelists agreed that the speed at which reporting has changed has somewhat disadvantaged voters. Looking back at previous election cycles, reporters had more time to report and file their stories, whereas now candidates making announcements on Twitter can drive information in a news cycle, leaving no time for others to fact check or give any historical reflection. Luntz is the best-selling author of Words that Work: It’s Not What You Say, It’s What People Hear. The good-humored Luntz engaged the crowd about the 2016 presidential race, providing examples of candidates who had chosen their words well and others who had not. The best advice he offered the audience was that any opening sentence, whether made by a politician or business, is the most important and the closing sentence is the second most important. He also explained that not only is it the words which are chosen to convey a message, but strong, compelling visual images must accompany any well-crafted message. In addition to his work in politics and with the media, he has a client list that reads like the who’s who of the Fortune 500, advising companies such as Merrill Lynch, Coca Cola and the U.S. Navy. He also is the author of What Americans Really Want…Really: The Truth About Our Hopes, Dreams, and Fears. Looking ahead to 2016, The Reformers Agenda panel was moderated by Marshall Tuck from the New Teacher Center and included longtime reform activistBill Bloomfield, David Crane from Govern for California and Charles Munger Jr., with Spirit of Democracy. The panelists, though coming from different political ideologies, all agreed that Californians need and deserve two well-functioning political parties to fairly govern and that legislators should be representative of their electorate. While recent reforms such as redistricting and the top two primary have done a lot to improve the California political landscape, all panelistssaid that campaign finance reform is another important issue that needs to be tackled. The final panel of the day featured a discussion with legislators on “The Wizards of What’s Next—2016 Second Year Session Preview,” moderated by CalChamber President and CEO Allan Zaremberg. Panelists included Assembly Member Cheryl Brown (D-San Bernardino), Assembly Member Ling Ling Chang (R-Diamond Bar), Assembly Member Tom Daly (D-Anaheim), Senator Cathleen Galgiani (D-Stockton), Assembly Member Jimmy Gomez (D-Los Angeles), Assembly Member Chad Mayes (R-Yucca Valley)and Assembly Member Rudy Salas (D-Bakersfield). The panelists all shared a sense of optimism as they look toward 2016. Term limits have done a lot to embolden legislators to feel and act like an equal branch of government. In 2016, legislators are looking forward to building bipartisan relationships, improving institutional memory, and increasing regulatory oversight. Panelists are also looking forward to creating a strategic plan for California and then drafting legislation to implement the plan, which will also include removing old and out-of-date laws from the codes. With a more comprehensive plan, new leadership and committee assignments next year, this class of legislators will be able to spend their terms focusing on crafting better legislation because they will have longevity to better serve their constituents.